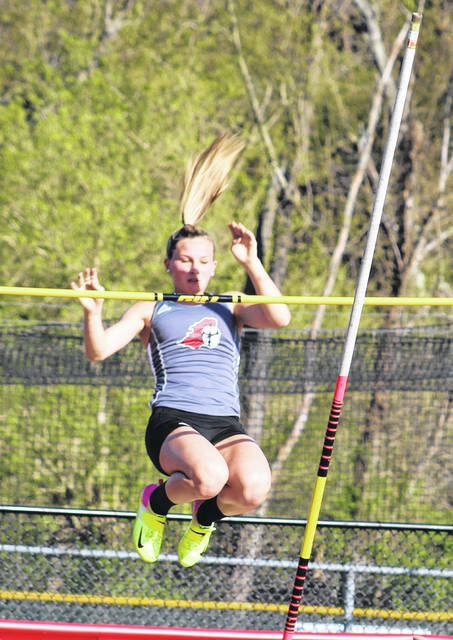 Point Pleasant sophomore Kaydean Eta, center, clears the final obstacle during the 110m hurdles event at the 2018 Battle for the Anchor held at OVB Track and Field on April 30 in Point Pleasant, W.Va.
Point Pleasant sophomore Sami Saunders clears the bar during the pole vault event at the 2018 Battle for the Anchor held at OVB Track and Field on April 30 in Point Pleasant, W.Va.
WINFIELD, W.Va. — A busy weekend is approaching. 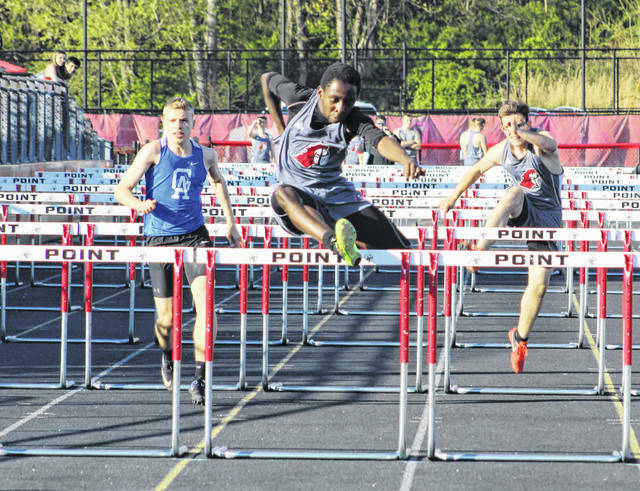 The Point Pleasant track and field programs combined to qualify 23 athletes in 24 state events while coming away with a pair of runner-up finishes Wednesday at the 2018 Class AA Region IV championships held at Winfield High School in Putnam County. The Black Knights won three event titles and had 16 top-three efforts en route to final tally of 138 points in the boys competition, while the Lady Knights earned a single event crown and a half-dozen top-three finishes while scoring 75 points in the girls meet. Host Winfield continued its dominance at the Region IV event as the Generals posted a winning score of 271 points, while the Lady Generals finished the evening with 215 points. The Nitro boys (77) were third out of nine scoring squads and the Sissonville girls (48) were third out of 10 scoring teams. The Black Knights had state qualifiers in 13 different events, including multiple qualifiers in both throwing events. The Red and Black also qualified for states in all five relay competitions. The 4x110m shuttle hurdles relay team — consisting of Zach Rediger, Logan Southall, Brady Adkins and Kaydean Eta — won the Region IV title with a time of 1:02.63. Eddie Mayes was the shot put champion with a throw of 45 feet, 1 inch, beating out teammate Jesse Gleason (45-0) for top honors. Gleason, instead, ended up winning the discus championship with a heave of 134 feet even. The quartet of Jovone Johnson, Cason Payne, Steven Trent and Josh Wamsley finished second in the 4x100m relay (45.81), while Johnson, Payne, Wamsley and Garrett Hatten ended up as the 4x200m runners-up with a mark of 1:35.78. Payne, Wamsley, Hatten and Nick Leport were second in the 4x400m relay (3:47.77), while Leport, Peyton Hughes, Luke Wilson and Brady Adkins were the 4x800m runners-up with a time of 9:27.58. Eta was the 110m hurdles runner-up with a time of 16.32 seconds, with Adkins also placing second in the 300m hurdles event with a mark of 43.77 seconds. Trent was also second in the pole vault with a cleared height of 11 feet, 6 inches. Wilson joined Gleason as the only individual multi-event qualifiers after placing third in both the 1600m run (4:47.35) and the 3200m run (10:23.21). Payne was third overall in the 200m dash with a time of 23.71 seconds. Trevon Franklin was third in the shout put (42-0), while Alex Gibbs finished third in the discus (125-5). The Black Knights — who will have 16 different competitors at state — did not earn a single at-large bid with any of their fourth-place efforts. The Lady Knights had state qualifiers in 11 different events, which includes a trio of relay competitions. The Red and Black, however, earned five different at-large bids for the state meet. The lone Region IV championship went to Sami Saunders in the high jump after clearing a height of 5 feet, 2 inches. Saunders also placed third in the pole vault (10-0) and advanced in the long jump with a fourth-place effort of 14 feet, 4½ inches. Saunders, Madison Hatfield, Sydnee Moore and Teagan Hay were the 4x100m relay runners-up with a time of 53.53 seconds. Moore, Hatfield, Hay and Allison Henderson also placed second in the 4x200m relay with a mark of 1:53.00. Hannah Gleason was the discus runner-up with a heave of 76 feet, 6 inches. Hay was also third in the 200m dash (27.51) and advanced in the 100m dash with a fourth-place effort of 13.23 seconds. Henderson was fourth in the 800m run (2:34.16), but advanced to state with an at-large bid. Hatfield also advanced to state with a fourth-place effort of 1:04.08 in the 400m dash. Henderson, Moore, Hatfield and Ashley Staats also got an at-large bid in the 4x400m relay with a fourth-place time of 4:34.58. The 2018 WVSSAC track and field championships will be held Friday and Saturday at Laidley Field on the campus of the University of Charleston. Visit runwv.com for complete results of the 2018 Class AA Region IV championships held at Winfield High School.